Many people dismiss the possibility of owning a pool, because they think it will be too expensive to install and maintain. We are here to eliminate those myths! The fact is, there are types of pools to fit any budget or lifestyle, and at the end of the day, a pool brings an oasis to you. North Georgia Pools is here to make sure you get a pool that will stand the test of time – and to take care of it for you. You have several different choices when it comes to the pools we offer. An above-ground pool provides portability, easy maintenance, and full pool features including steps and diving boards. If you want an unbeatable warranty, endless options, and cheap repairs, lining an in-ground pool with a vinyl liner may be the option for you. 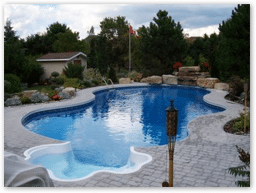 We also offer a wide variety of fiberglass pool designs, which deliver easy maintenance, world-class longevity, cost-effectiveness, and durability. To make a long story short: no matter which pool fits your budget, you will enjoy massive benefits! When you decide to have us install your pool, we will sit down with you to understand exactly what you want and can afford. Our installation process is efficient, professional, and we always take care not to damage your landscaping. We will communicate throughout the entire process, so you know exactly what we’re doing and what comes next. Once your pool is installed, we will be there to maintain your investment like it’s our own. Call today!